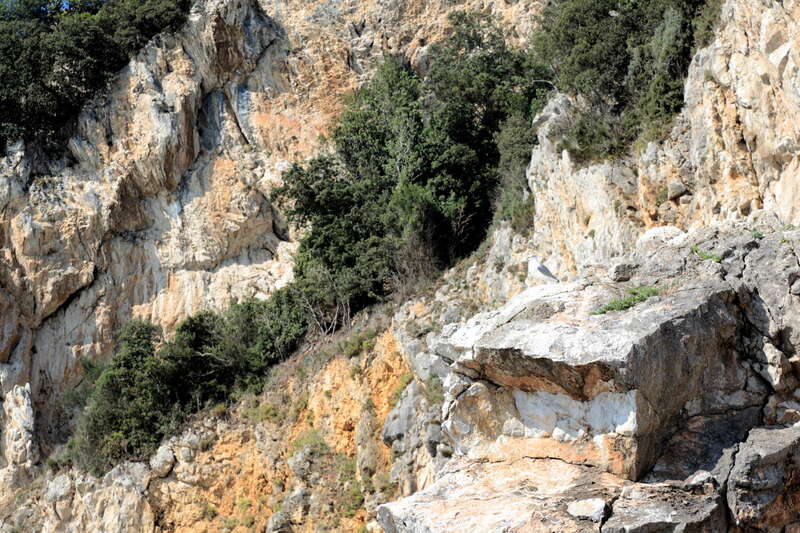 Monte Buciero has around 20 caves and small abris or rock shelters. Human occupation is known in at least seven of these caves. Engravings have been found in two of them - Peña del Perro and Cueva de San Carlos, also known as Cueva del Fortín. 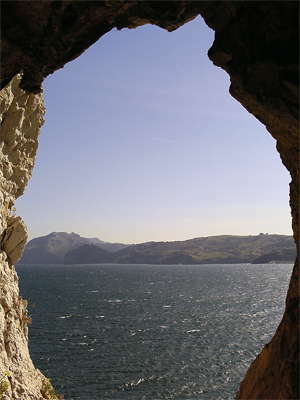 La Peña del Perro (El Perro) is one of a number of rockshelters on the Cantabrian coast, close to the Bay of Santoña and marshes at the mouth of the Río Asón. The site was occupied from the Late Magdalenian through the Mesolithic and contains Azilian and Mesolithic shell middens, along with representative lithic, bone, and faunal deposits. The osseous industry included several temporally diagnostic pieces, including an Azilian perforated unilateral harpoon and a number of decorated sagaies. The artifacts from El Perro are suggestive of minimal maintenance or repair activities as the primary fibre-based tasks at the site. Monte Buciero has a long military history. It is near the village of Santoña (population 12 000), Cantabria, on the northern coast of Spain. The mountain has three 19th century fortresses, seven coastal batteries and two powder magazines. In this photo we can see the Fuerte de San Martín in the centre of the photo, just above the brown stripe on the beach, with Fuerte de San Carlos visible on skyline on the far right of the photo. Napoleon's army took possession of this mountain during 1810-1814. It has been an important military target since the first century because of the protection of its bay and its strategic placement at the southern end of the Bay of Biscay. 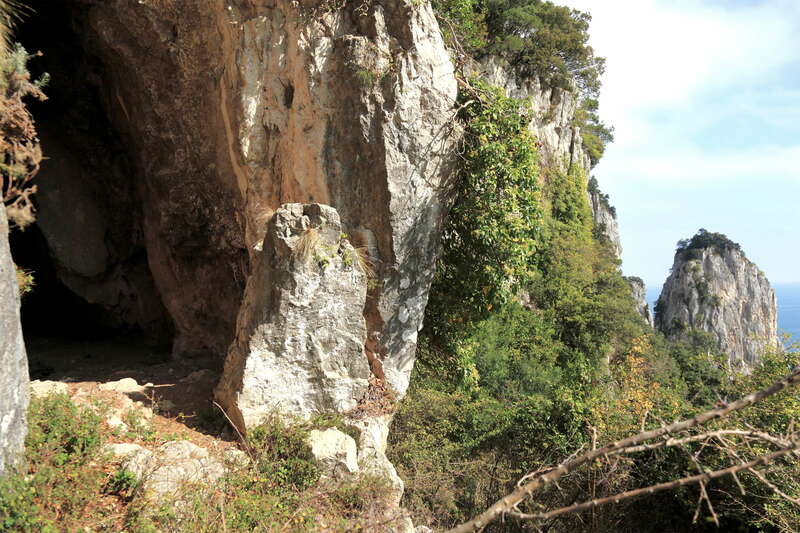 Buciero mountain has around 20 caves and small abris or rock shelters. Human occupation is known in at least seven of these caves. 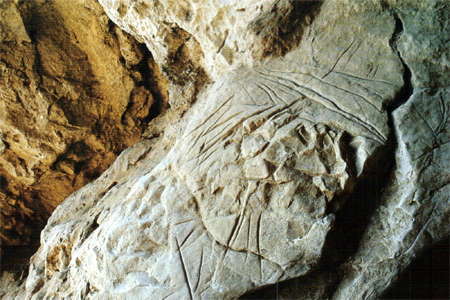 Engravings have been found in two of them (Peña del Perro and Cueva de San Carlos, also known as Cueva del Fortín). Sea level during the latter part of the ice age. 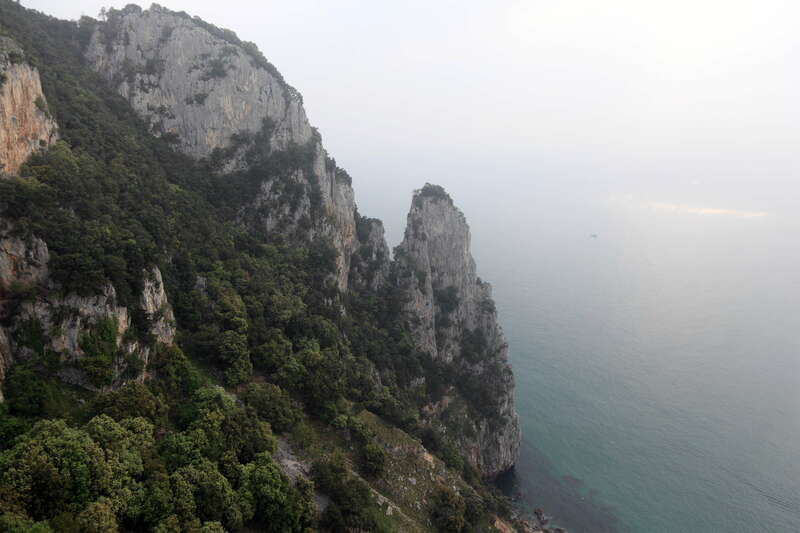 There was a wide coastal plain in front of Monte Buciero and the rock shelters and caves there. The position of La Peña del Perro is marked with a red circle. 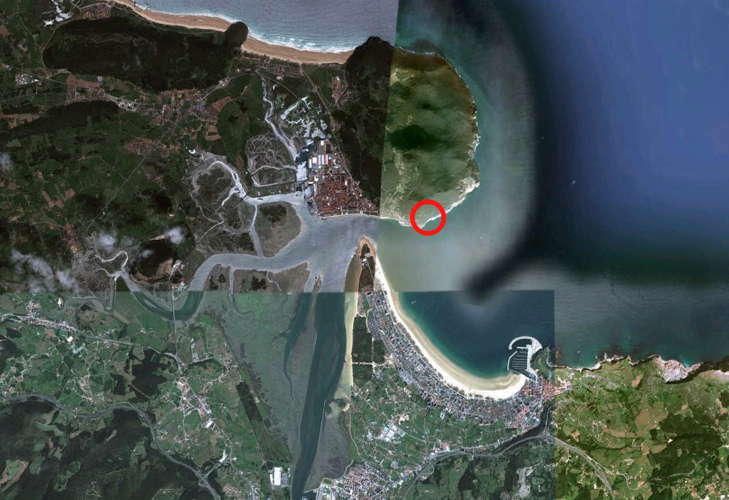 The town shown here in the upper photo is Santoña, with the Río Asón coming in from the south, a classic 'ria' or drowned river valley, formed when the sea level rises, flooding a former river valley and forming an estuary. The round green promontory is Mount Buciero, formerly an important military position, with Napoleonic fortresses. The fortress visible in the lower photo is Fuerte de San Carlos. 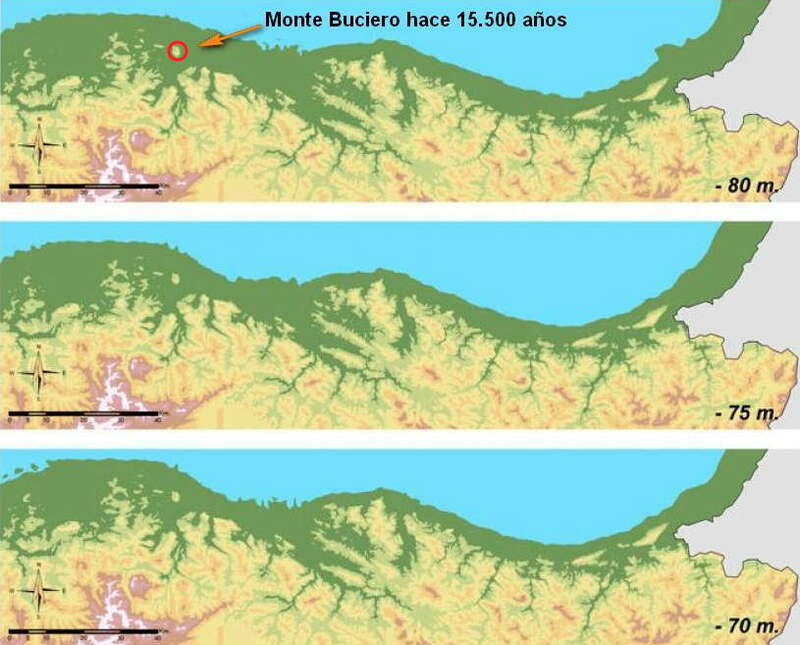 The sites of La Fragua and El Perro recently excavated by González Morales et al. 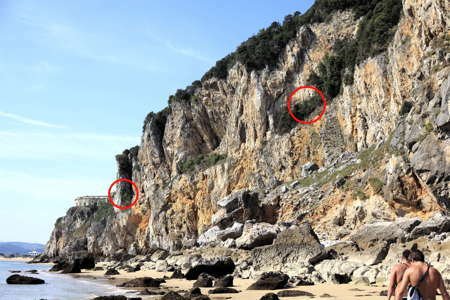 are respectively a very small cave and a narrow rock shelter in very strategic (but rather exposed) positions on Monte Buciero, overlooking the Asón and what would have been during the late ice age an exposed strip of continental shelf some 3–5 km wide. The lowest archaeological level in El Perro dates to 12 140±180 BP. It has a small lithic assemblage - also on the excellent local black flint, as at La Fragua - and a bone industry including an eyed needle and several antler sagaies, some of which are decorated. There are only a few marine molluscs (limpets). The macrofaunal remains from both sites (currently under study) include the same range of game species as in Otero and Chora, with particularly many red deer together with ibex, which is not surprising given the proximity of these rocky slope sites to the coastal plain. Scattered patternless lines made with a burin of flint. Experts call them spindle shaped and engravings have been found in different Palaeolithic sanctuaries along the entire coastal strip. The groove is wide and deep in the central part and tapers and becomes more shallow towards the ends. This type of engraving is common in Levantine cave art. The engravings of this picture greatly resemble those found in the Monte Buciero area, however they belong to the La Vall de Gallinera, Alicante, on the Mediterranean coast of Spain. Since the 1980s spindle shaped engravings were found in a number of caves on the Cantabrian coastal strip. It is a large shelter, facing southeast, 17 metres wide by 10 metres in depth. It contains an archaeological site which was recently excavated by a team led by M. González Morales, who have documented the Upper Magdalenian occupations / End of Azilian and post-Azilian Mesolithic, the latter with large middens. The dating and significance are problematic, though probably Paleolithic. Engravings of the linear spindle type are relatively abundant in the Cantabrian area, including Conde, Cueto de la Mina, Las Bruges, Venta de Laperra, etc..), similarly in the Mediterranean region (Volcan del Faro de Cullera, Rates Penaes, Ramito, etc.). Some of these sets of lines are certainly ancient, at times covered by Paleolithic layers, as in Cantabria with del Conde, La Vina, Entrefoces, or in the Mediterranean, Volcan del Faro de Cullera. The first wall decorations can be attributed to both El Conde and La Vina, while some of the caves of the Mediterranean are apparently Magdalenian. The cave was discovered in 1983 by members of CAEAP (Collective for the Amplification of Prehistoric and Archaeological Studies, a group of archeologists in Cantabria), who also found the rock carvings. 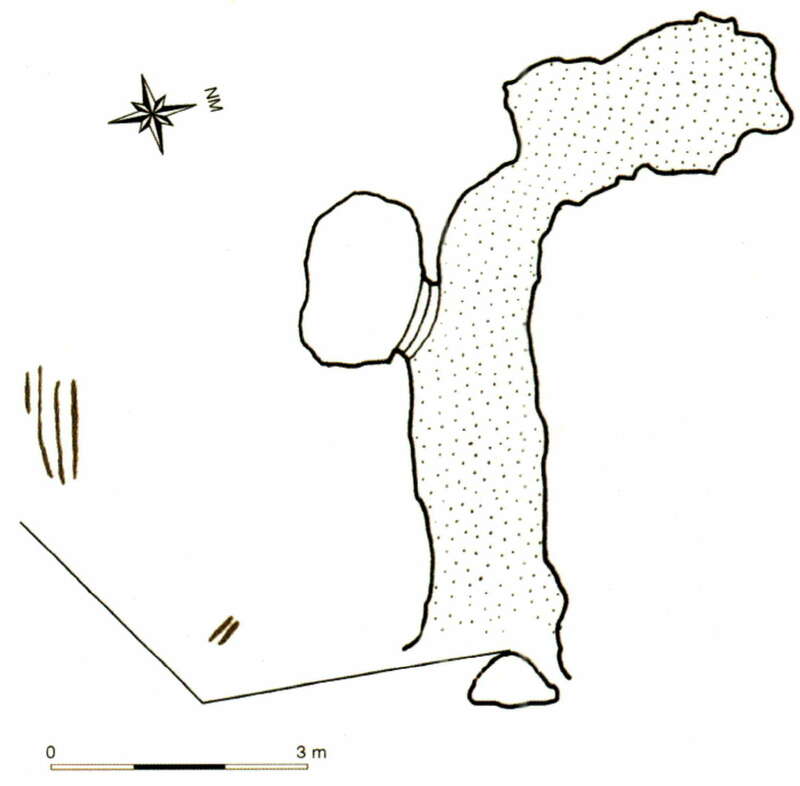 Plan of the cave, with the position of the engravings shown, as well as a line drawing of the engravings. Pena perro and San Carlos Caves high up on the cliff, with Fuerte de San Carlos on the skyline at the end of the cliff on the left of the image. Peña del Perro circled on the right, Cueva de San Carlos on the left. The shelters were originally at ground level when the sea was lower during the last ice ages, with the sea coast about five kilometres away to the north about 12 000 years ago. The rising sea has washed away the former coastal plain, leaving the caves and abrigos high on the cliff, and difficult of access. Peña del Perro, the entrance screened by vegetation. Cliffs of Buciero, a few hundred metres to the east of Peña del Perro. During the last ice age, the sea coast was five kilometres away, about 12 000 years ago when the caves and abrigos were used for temporary shelter by people who moved up and down the valley of the Río Asón. Faro del Caballo lighthouse on the cliffs of Buciero, visible on the far right of the panorama above. The artefacts from El Perro are suggestive of minimal maintenance or repair activities as the primary fibre-based tasks at the site. Of three artefacts studied, the eyed needle and the bi-pointed bone splinter have identifiable wear, primarily from animal-derived sources. The site is a shell midden with limited evidence of longer stays or diverse economic and subsistence activities, so it is unsurprising to find little evidence for the manufacture of perishable technologies. The use of the eyed needle on hides and leathers is likely from repair, as construction of leather clothing or other structures is generally done without the aid of a needle. Cueva San Carlos engravings. Note that the smaller lines are on the left, not on the right as shown in the diagram below. The first cave has not been studied by archeologists, but it has shell middens, so it was occupied by humans at one time. The shells are lapas, or limpets, and caracolillos or snails. The cavity has a relatively large entrance, facing east, 3 metres in height and 1.5 metres wide, of triangular shape. This gives access to a fairly straight, narrow cavern. On the left about half way down is another small room, after which the main passage veers to the right. The cave is 12 metres deep altogether. There are the remains of a midden of possible Azilian age, with some marine shells (Patella vulgata and Littorina littorea), bone fragments and flint, cemented into the right wall in the centre of the passage, about 10 m. from the entrance. In the centre of the passage is an illegal modern pit, where there are yellow sterile levels. 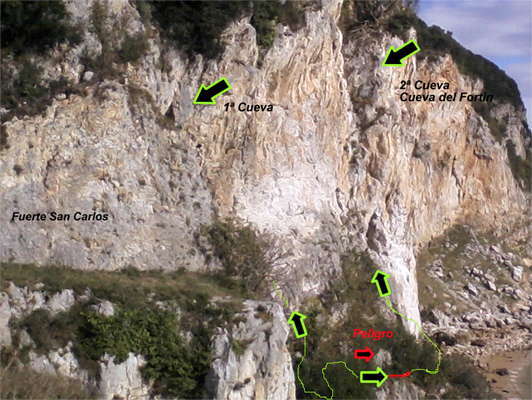 There is only a small panel of spindle-like lines similar to Peña del Perro, located in a rocky limestone outcrop on the right side of the mouth of the cavity. It consists of two groups of strokes, the top group consisting of four vertical and parallel lines, about 6 cm. length, except the leftmost line, which is about 3 cm., and the lower group, consisting of two short lines, oblique and parallel, about 2 cm. in length. As with the neighbouring engravings in the abrigo of Peña del Perro, these engravings are also probably paleolithic. The cave was discovered in 1983 by CAEAP. 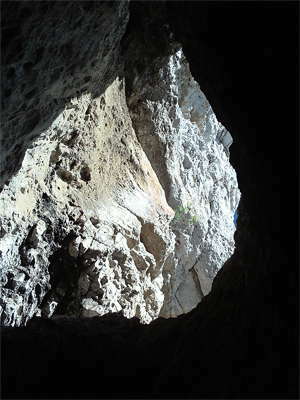 View into the interior of the cave. The cave has a dramatic entrance. 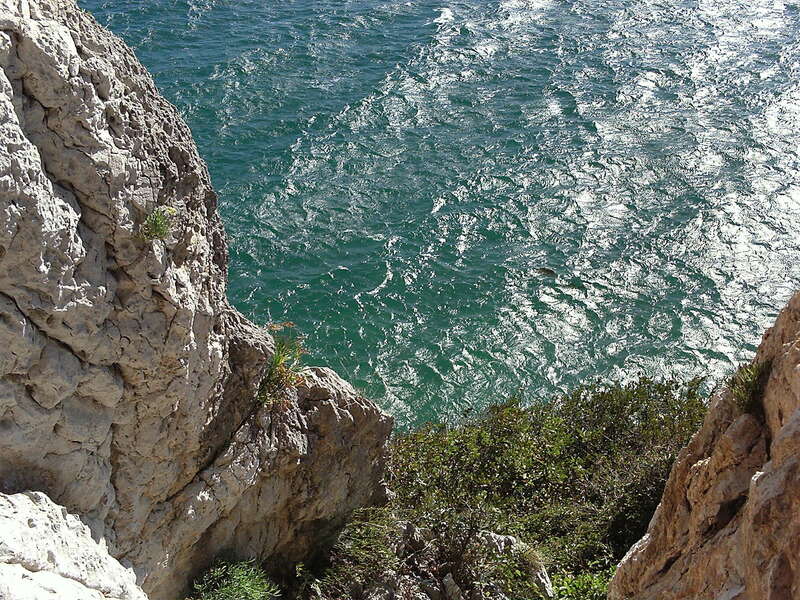 The drop from the entrance to the sea is spectacular! 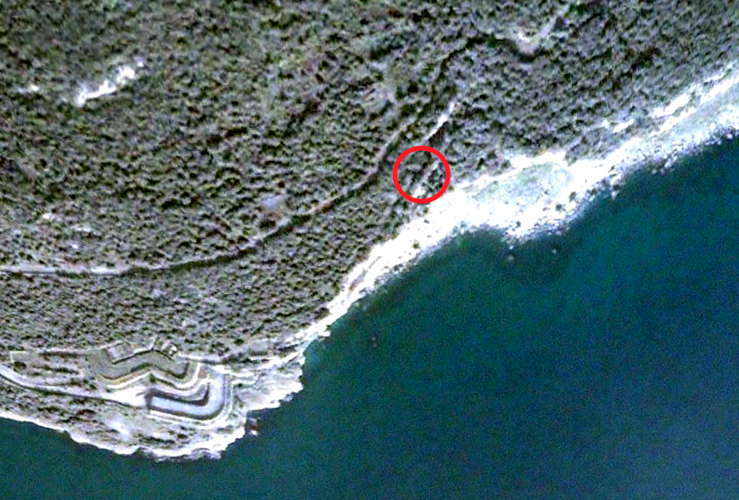 In this area there are at least six rock shelters and a cave. They were all occupied around 12 000 - 6 000 years ago. 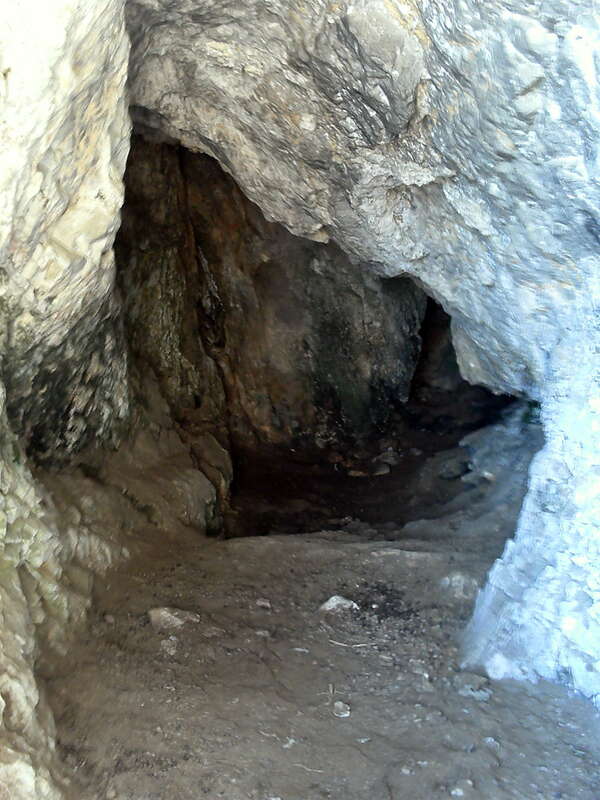 Cueva de la Higuera, or Cave of the Fig, in the area of Peña del Fraile. La Fragua - note Peña del Fraile (The Priest's Rock) nearby. The sites of La Fragua and El Perro recently excavated by González Morales et al. are respectively a very small cave and a narrow rock shelter in very strategic (but rather exposed) positions on Monte Buciero, overlooking the Asón and what would have been during the late ice age an exposed strip of continental shelf some 3–5 km wide. 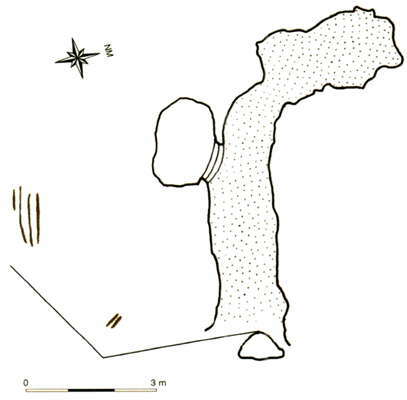 The lowest level in La Fragua has a small artefact assemblage (including an antler wand with an engraving of a horse and débitage) and a few macrofaunal remains. The stone artefacts are of an excellent-quality black flint - probably from the Plentzia limestone formation which outcrops along the modern shore 9 km to the east, but which may have been available nearer to Monte Buciero on the now-flooded continental shelf. This level in La Fragua is so far undated, but is likely to be of early Magdalenian age. 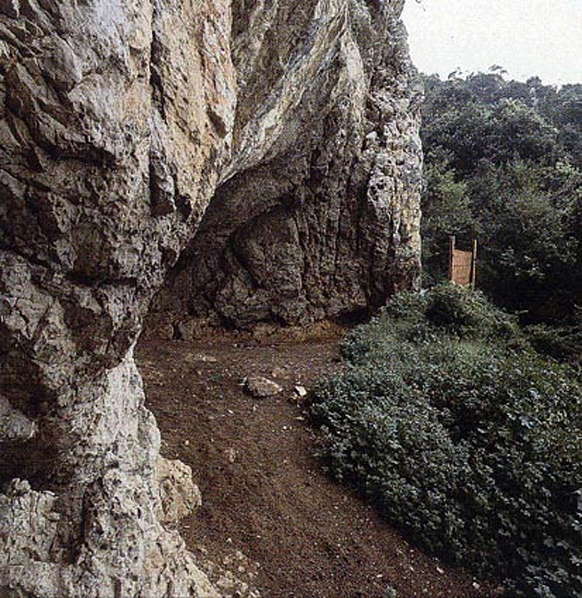 Photograph of the southeast side of Monte Buciero showing La Fragua Cave (the red arrow shows the present location of the cave) (left). General view of Monte Buciero and the river Asón drainage basin from Laredo (right) (Photograph: Gutierrez Zugasti). 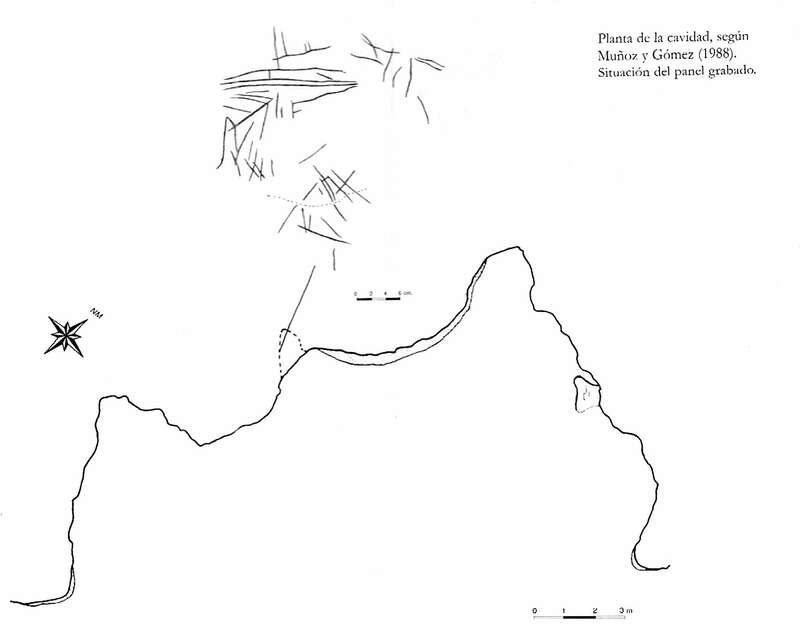 Plan of La Fragua cave with grid system (topography by E. Torres). Stratigraphic sequence of La Fragua Cave (drawing by M. González Morales). La Fragua Cave is located at 125 m. above sea level on the southeastern slope of Monte Buciero, in Santoña (eastern Cantabria, Spain). The cave is relatively small – roughly ten metres long by three metres wide at most – but is well sheltered and favourably oriented. Its position was once strategic, with extensive low-lying ground, but this ground is now largely flooded by the sea forming the Santoña Bay at the Holocene mouth of the Asón River, as well by the Cantabrian Sea along the late glacial coastal plain. The shore and present-day coastal plain are easily accessible from this location, shown by the extensive shell-fishing done during the Holocene Mesolithic period. The total area of La Fragua Cave is about 16 m2. Only 6 m2 of this has been excavated, but this is in the central part, which is the most inhabitable and spacious area of the cave. The excavation was conducted under the direction of M.R. González Morales and Diaz Casado (1992) between 1990-1996. – Level 1.0: Surface of the shell midden, with a dirt matrix from of the above stratum. – Level 0.1: Series of hearths and alternating ash and charcoal layers with burnt clay (recent pastoralist fires). The area excavated in the cave is not uniform: the levels in the eastern part of square A5 and most of B5 were cut by an old north-south trench, which contained a deposit of mixed fill, limestone blocks and fragments, and numerous animal bones. 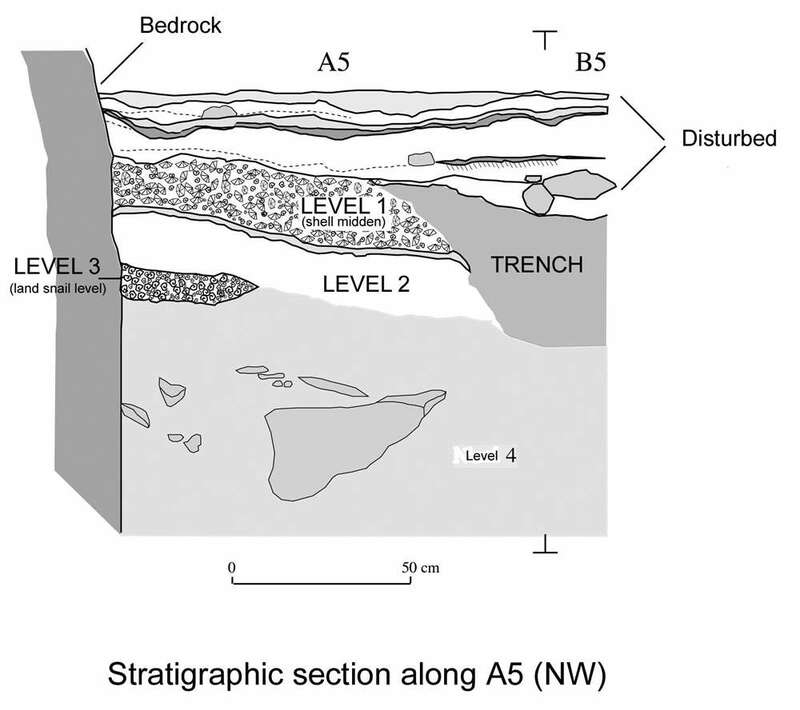 The trench completely cuts through the stratigraphic sequence of the cave and was filled in part with material from Level 1. The trench was sealed by hearths made by shepherds who used the cave in the last century, although the age of the trench itself is unknown. 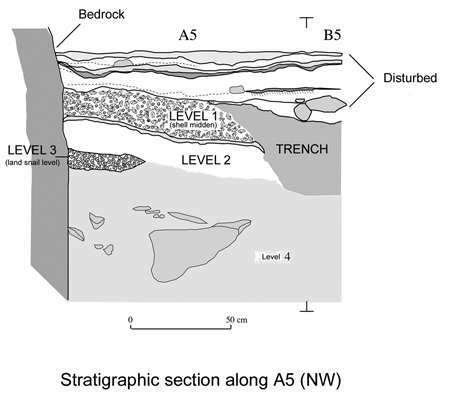 It is unquestionable, however, that the trench was dug subsequently to the deposition of Level 1. The material found in the trench included several fragments of pottery, a material not found in any other level, which, by their typology, appear to correspond to ceramics from the Chalcolithic period (ca. 4500 – 3500 BP). Although this trench contains wild and domestic faunal remains, the results of their analysis are not representative and have not been included in this paper due to the presence of a mixture of materials probably belonging to different periods. However, it is worth stressing the recovery of an ulna of a seal in this trench, which is rarely found in Cantabrian settlements, although it could belong either to the Mesolithic or Calcolithic level. The complete chronology of La Fragua Cave is presented in Table 1. 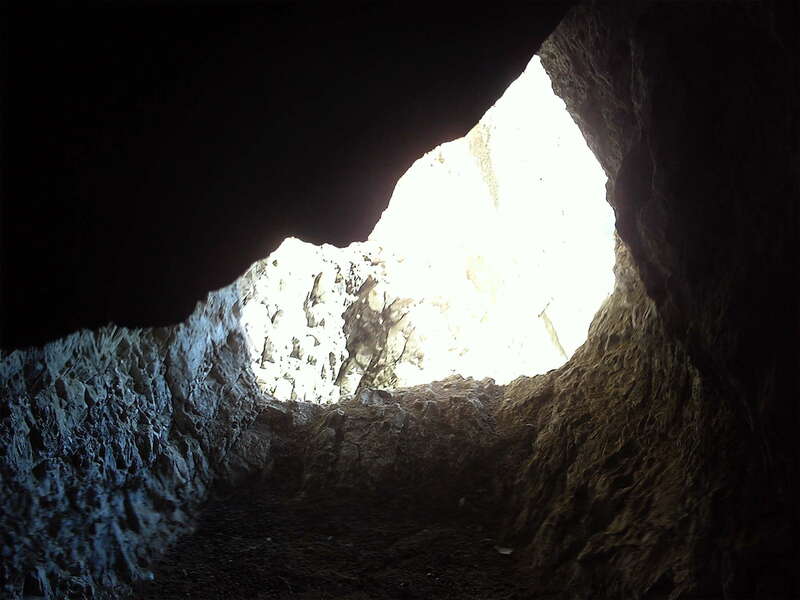 Due to the varying characteristics of the cave deposits, a better preservation of the original spatial distribution of the materials was expected in the lower levels, especially in Level 4. 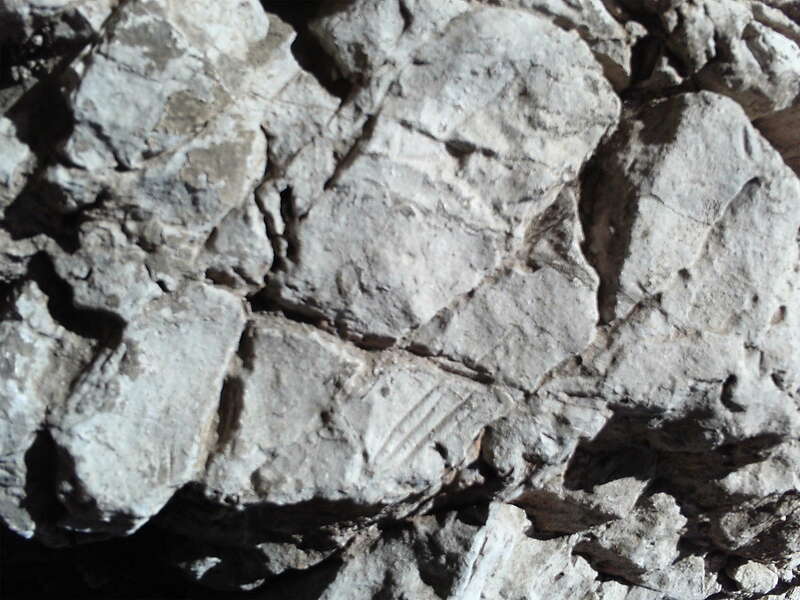 Conversely, the heterogeneity of Level 1 was to be expected, because of the greater mobility of its components (i.e., shells) for lack of a dense sedimentary matrix. The most significant disturbance is due to the sub-recent trench in the upper levels at the east end of the cave. 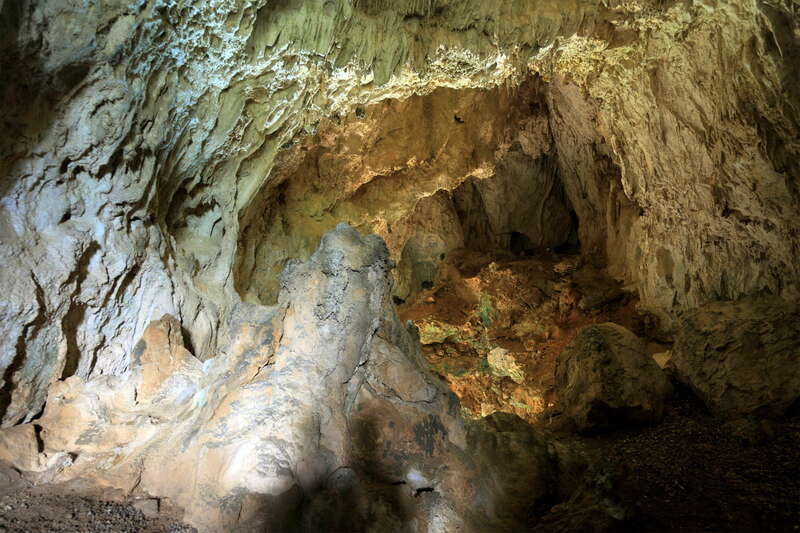 The cave is relatively small – roughly 10 metres long by 3 metres wide at most – but is well sheltered and favourably oriented against winter conditions. Archaeological excavations carried out at the site between 1990 and 1996 revealed the existence of continuous human occupation from the late upper Magdalenian to the Neolithic, making it one of the few Late Glacial sites on the Bay of Biscay coast to have survived the steady rise in sea level. From the subsistence point of view, this site has been described as a secondary camp for the exploitation of resources in its immediate surroundings, within a territorial system that would have included the whole Asón valley, with large habitation sites like El Mirón located in the interior area. Thus, the taxonomic composition of the recovered faunal assemblage is typical of a specialised hunting strategy focused on temperate fauna, mostly red deer and ibex, although some wild boar and roe deer remains are also present. This taxa representation is coherent with the general pattern of the Cantabrian Coast during the Holocene and follows the progressive displacement of Arctic fauna observed during the Late Pleistocene. The seasonality of the site indicates that the cave was mainly occupied during later summer and autumn, when food was stored in considerable quantities in anticipation of the coming winter season. Ulna of a Monk Seal, Monachus monachus recovered at La Fragua Cave. The black arrows show the cut marks located in the medial part of the olecranon. Detail of Monachus monachus olecranon showing parallel long cut marks on the medial side. 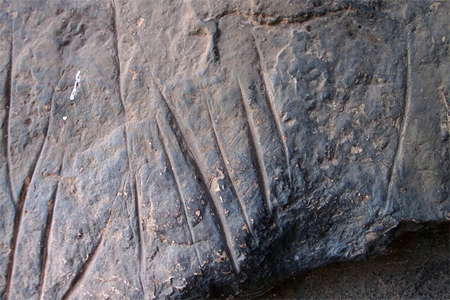 The shape and distribution of these cut marks suggest defleshing activity. Three of the four bone fragments that we report on here were found in a trench that was dated to Holocene in age and cuts through uppermost Pleistocene strata and the other one was recovered from the surface. The fragments are from an ulna belonging to an adult individual, possibly male, of the Order Pinnipedia and Family Phocidae. Remains of this species have not been reported before from the Spanish shore of the Bay of Biscay. The total weight of the bone is 62 g, with an overall length 16.8 cm. The state of preservation is good, but some vermiculations can be seen on its surface, with slight evidence of manganese oxide staining. 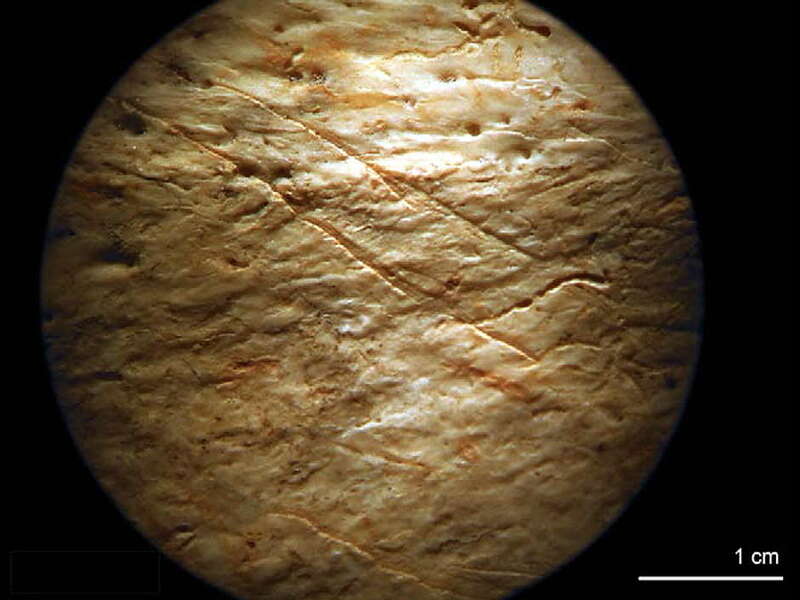 The olecranon displays several incisions and scrape marks of anthropogenic origin, consistent with butchery tasks. This is, therefore, an individual that was prepared for human consumption and presumably caught in the immediate vicinity of the site that must have offered conditions well-suited for this species. 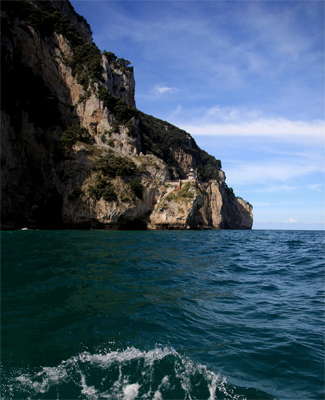 In fact, Monte Buciero, contains numerous underwater caves that could have been an ideal breeding area for seals. 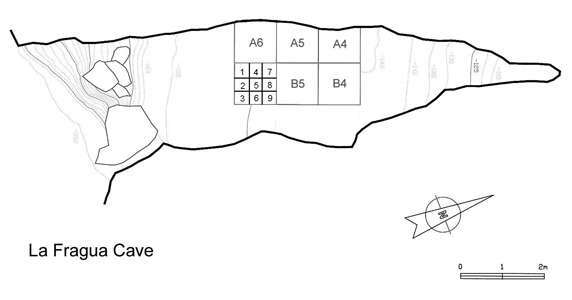 The presence of these cut marks and the absence of ornamental features ruled out the possibility of long range transport of the carcass. From the start, bone morphology rules out the possibility that the specimen belong to the seal population that currently inhabits the North Atlantic Ocean. Finally, we succeeded in identifying the bone as belonging to Monachus monachus. Owing to the importance of the find, the bone was dated by C14-AMS, giving a result of 5540±40 BP (GX-32380). This determination meant that the use of the animal could be attributed to human groups who occupied the cave in the late Mesolithic or early Neolithic. Similarly, DNA was extracted from the bone by Cecilia Anderung at the Natural History Museum in London. Unfortunately, because of the poor state of conservation of internal tissues, it was only possible to isolate some sequences of mitochondrial DNA, which clearly belonged to a phocid, but due to their short length, could not be associated with any species in particular. Monachus monachus, the Mediterranean Monk Seal. 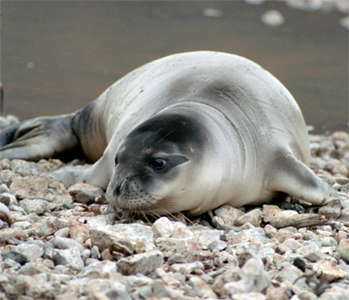 Regarding monk seal habitat, at present only some 550 individuals are known to survive, most of them located off the coasts of Greece and the western Sahara, although historically, before fishing activity reduced its population dramatically, this species occupied a wider geographical area which included the Mediterranean, the Marmara and Black Seas, the Atlantic coast of Africa (Mauritania, Senegal and Gambia), the Canary Islands, the Azores, Madeira and Cape Verde. It is able to tolerate high temperatures, with no risk of hyperthermia, by lowering its metabolism during sleep and by exposing its paler ventral area. On the contrary, it avoids colder habitats. This tolerance to warm waters is its distinguishing feature within the family of the pinnipeds, and which is used in the present study as a climatic marker, as its presence in high latitudes could be related to a regime of warm marine currents. This species has been sighted very sporadically in the Bay of Biscay in modern times, reaching the coast of Cormier and the south of the Loire estuary. From an archaeological point of view, the only remains of monk seal that have been identified on the coast of the northern Iberian Peninsula have been found on the islet of Guidoiro (the Arousa Islands, Pontevedra) and attributed chronologically to the Bronze Age, with a date less than 4000 BP and are probably the result of natural death. These facts reinforce the idea that, unlike the rest of the Late Glacial, monk seal has been able to reach the Cantabrian Sea, at least in certain periods, after the mid-Holocene. In contrast, the Mediterranean coast of the peninsula, where sea temperature is higher and more stable, has provided more evidence of the consumption of this taxon, for example at Gibraltar during the Middle Paleolithic and at Cueva de Nerja in the late Upper Paleolithic.